This time Palaeoporn goes monochromatic! Naraoia (above, scale = 1 cm) has featured here before (what? . . . I know it's not monochromatic, just wait), but this time I’m going to show what a little black and white photography can do (see!). First of all, this (right) is what Naraoia looked like in the flesh. It had two ‘shields’ an anterior, or head shield, and a posterior shield. These shields overlapped, so that the posterior end of the head shield rested over the anterior edge of the posterior shield. 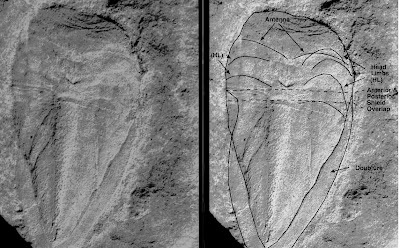 Underneath the shields, the body looked very much like that of trilobites, to whom they are closely related. In other words they had a many segmented body (including the head), and a pair of biramous appendages on most segments. 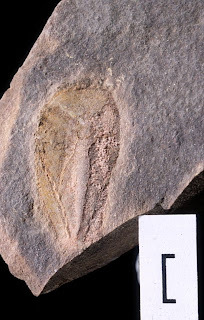 Fossils from the Lower Cambrian Emu Bay Shale are not exceptionally well preserved when it comes to fine structure. The fossils have been recrystallised into hulking great fibrous calcite crystals during a subsequent tectonic event. But, they do look good in colour, even the one above which is not a particularly good specimen. However, occasionally you can get some detailed information, and then the best documentation is obtained using black and white photography, which is why this is still the preferred medium for journals, especially where structure is indistinct and a bugger to document! All the photography here was done the old fashioned way, before that new-fangled digitally enhancement, with honest to goodness film, and dark rooms, and the inhalation of toxic chemicals during development and printing, Didn't effect me though, but I digress . . . err, who am I again? Basically light and shade can show up very fine structures that colour cannot. Maybe because we can interpret subtle changes in greyscale as meaningful structures, whereas this is more difficult in colour, I don’t know. But by varying the intensity and the angle of the light, and by using high magnification and very slow film (in this case Ilford 100 and Ilford Pan F Plus) structures can be seen that are either absent of very difficult to see in colour photos. Below I’ll show a couple of examples of what I mean. Here is a black and white image of another specimen of Naraoia (click to enlarge). This time you can see some structure. The image on the right has been augmented to show them. Other than that the image has not been manipulated, and the structures are seen because the angle of the light hitting the specimen is very low. A number of structures in the head can be seen, including the antennae, legs and a remnant of the hypostome, which is a rigid plate that sat directly in front of the mouth. A very thick doublure is also present. This is where the posterior shield has folded back on itself around the margin. This strengthens the shield. The area where the two shields overlap can also be seen. Now this image is a scan of a negative that has been converted to a JPEG file and then uploaded, so some detail has been lost, but they are there . . . trust me, I’m a doctor! This image is a magnification of the last (click to magnify further), but with a slight change in the light intensity, and the angle. Other than that, and the augmentation of the right hand image, there has been no manipulation. The field of view is approximately 1 cm by 1.5 cms. Despite the fact that the magnification resulted in a very small depth of field, a number of structures are visible, in fact more so that in the last image. 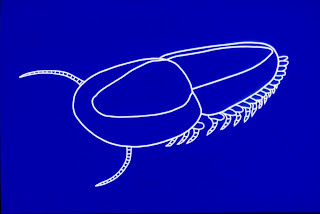 There are at least 6 head appendages behind the antennae (at a push), and the hypostome is visible. Also, the margins of the anterior and posterior shields are there. There is also a lot of wrinkling. This is because, in life, the critter was quite domed, and that has been flattened out leaving the mass of wrinkles at the front of the head. Also the left hand margin of the posterior shield is twisted near its anterior margin, and a number of major wrinkles have formed on the posterior shield in response to this twist. If you can't document your structures, you can't publish them. Which is fine if you are dealing with Burgess Shale levels of preservation. However, the rest of us have to rely of long hours in the photography suite playing with magnification, light intensity, and lighting angles. That's before you get to the developing and printing phase. Mmmmm . . . developing fluid . . .